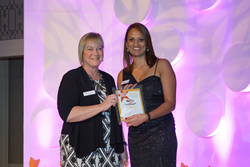 Petplan's Vet Tech of the Year winner Purvi Patel (r) with NAVTA's Julie Legred at the 2017 Veterinary Excellence Awards. In 2019, the award will be named Registered Veterinary Nurse of the Year. “We think a standardized credential for veterinary nurses is long overdue—not only to recognize the quality of the care they provide, but to continue to elevate the profession,” said Petplan co-CEO Natasha Ashton. Petplan pet insurance today announced their endorsement of and sponsorship support for the Veterinary Nurse Initiative (VNI), created and led by the National Association of Veterinary Technicians in America (NAVTA). VNI is actively pursuing nationwide legislative amendments to establish the name and credentialing of Registered Veterinary Nurses (RVN). Petplan will sponsor the initiative primarily through the annual Veterinary Excellence Awards, an industry event designed to honor and promote the best and brightest in the veterinary industry, and with the launch of a new veterinary nurse-focused column in its quarterly pet health magazine, fetch!. “We’re so pleased to lend our support to this initiative,” says Natasha Ashton, co-founder and co-CEO of Petplan. Petplan and NAVTA have also partnered to collaborate on the new fetch! column, “The IV League,” that will provide readers with an inside line to the advice and experience of some of the most hands-on members of their pet’s health care team. For more information about NAVTA’s Veterinary Nurse Initiative, click here. Petplan policies are underwritten in the U.S. by XL Specialty Insurance Company and in Canada by XL Specialty Insurance Company-Canadian Branch. The company is rated A+ by S&P (2017). Coverage may not be available in all jurisdictions. For more information about Petplan pet insurance, visit http://www.gopetplan.com or call 1-866-467-3875. The National Association of Veterinary Technicians in America is a nonprofit organization that represents and promotes the profession of veterinary technology. NAVTA provides direction, education, support and coordination for its members. Incorporated in 1981, NAVTA is the national organization devoted exclusively to developing and enhancing the profession of veterinary nursing and technology. For more information about NAVTA, visit their website at http://www.navta.net.